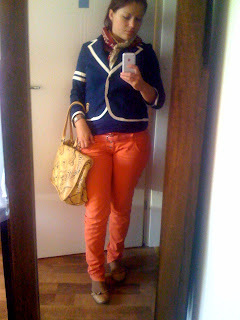 Shopaholic site - shopping, outfits, fashion, beauty, traveling and lifestyle blog: Navy and nectar = ? Navy and nectar = ? I finally received this blazer i ordered a lot of time ago from VS Pink. I thought i give it a try with my favorite pair of skinny jeans. I am 31 years old and i am a shopaholic... No, wait, just a regular fashion addict! When i am not shopping ( or blogging about it), i am the Content Manager at egirl.ro, one of the most important online women fashion and lifestyle magazines in Romania. At the moment i am a stay-at-home mom, taking care of my almost 2 years old, Lucas and buying shoes and pint-size clothes online.